Bullying in sports is a problem we see from players to coaches, even to the parents. A fine line exists between competitive play, aggressive coaching, enthusiastic parents and bullying. When does a player, coach or parent cross the line between fair play and foul play? I have spoken on ESPN radio to deal with the problems of bullying within sports. The increased involvement of negative behavior by parents on and off the field has led to Codes of Conduct being utilized around the country to lessen the impact of bullying. The RespectU Bullying in Sports Program was developed to help decrease bullying behavior seen on the sports field. It provides coaches, players and parents with the material they need to reduce the bullying that negatively impacts the enjoyment of sports in our youth. My training is practical, flexible and entertaining—and involves the entire team and community in solutions. If we provide the guidelines for sports to be competitive and fun, and help teams develop a ‘winning” attitude that does not involve bullying, we’re on our way to a successful season. I help players, coaches and teammates learn the difference between “fair play” and “foul play,” which sets the bullying line from the first day of practice. Bullying in the sports environment – Is it necessary or a hindrance to success? The program has been implemented successfully with all levels of players and a variety of sports. Along with issues of bullying in sports, summer camps are know to deal with the issue of bullying. Children come in groups from the same school and area and are introduced to children from other schools and areas. Not all of them will get along and at times their behavior can be hurtful to the other person from another area. 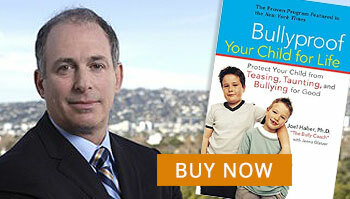 Learn more about Dr. Haber’s Summer Camp Bullying programs by clicking here.